I’ve been following and salivating for what seems like forever now as I’ve watched Motor Bar & Restaurant unveil their monthly specialty burgers. Every single one of them has looked completely delicious and every single month I tell myself that I need finally make it a point to stop in and eat there. General laziness got the best of me however and after missing out on awesome creations like their Bloody Mary Burger (an Angus patty smothered in Bloody Mary sauce and topped with grilled beef sticks, lettuce, tomatoes, red onions and provolone cheese), their B.L.T. Burger (a burger topped with a half pound of bacon, shredded lettuce, sliced tomatoes and a ranch aioli) and their All-American Burger (a hand packed Angus burger smothered in Motor’s Roadhouse Chili and topped with American cheese, bacon and a giant onion ring) I finally stopped in to try their burger of the month for October. This month Motor is featuring their Apple Bacon Burger, which consists of a half pound certified Angus beef patty topped with shredded lettuce, sliced onions, Swiss cheese, smoked bacon and apple slaw. It’s funny because I never eat coleslaw as a side dish, but for some reason when I order a burger or sandwich that’s topped with slaw (like the overstuffed sandwich I got from Lucky’s or like with this burger for instance) I absolutely love it. The apple slaw that Motor used on their Apple Bacon Burger was much better than your average coleslaw however, and was the perfect addition to this well-prepared burger. In addition to my burger I also tried a side of their mac & cheese, which was great as well. For the amount they give you it was also quite the steal at $3.95. Between that and the burger and fries I ate I left lunch feeling more full than I have in a long time, and for me and how much I eat that’s saying a lot. If you want to try the Apple Bacon Burger for yourself you have 14 more days to stop in at Motor and order it, but if you miss it I’m sure that next month’s specialty burger will be just as good. I’m ready for lunch now please! You forgot the best part, the pickle boo boo! Ewwww, I HATE pickles. There’s a burger place in Milwaukee that has deep fried pickles on their burgers and I won’t even eat them deep fried, which says a lot about how much I dislike them. Who has deep fried pickles on their burgers? I have to try that! Stack’d does. I think you can actually order them as an appetizer there as well. That mac and cheese looks FANTASTIC. It really was. Most times when you order mac & cheese at a restaurant it doesn’t taste any different than any of the stuff you can just buy from the grocery store, but the mac & cheese at Motor was super good. The Bloody Mary burger sounds amazing! However, what are “beef sticks?” Is that a euphemism for all beef hotdogs? The mac and cheese looks soooo good – I have yet been able to master homemade mac and cheese. Incidentally, one of the BEST parties I have ever been to was a birthday bbq party for this guy who loves mac and cheese. Instead of gifts, he asked people to make homemade mac and cheese and bring it for a contest. All the guests got to taste and vote and the top 3 winners won prizes provided by the birthday boy. There were huge 35 trays of mac and cheese in various incarnations. It was AWESOME. That birthday party sounds awesome! 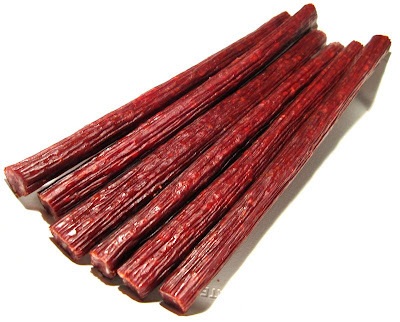 Beef sticks are just sticks of beef (that look like THIS) that are in most Bloody Marys around here. What?! Those look like slim jim’s! You guys put those in your bloody marys??? I’m stunned. I need to leave CA more often…. Yeah, they’re similar to Slim Jims, but usually a lot better quality. 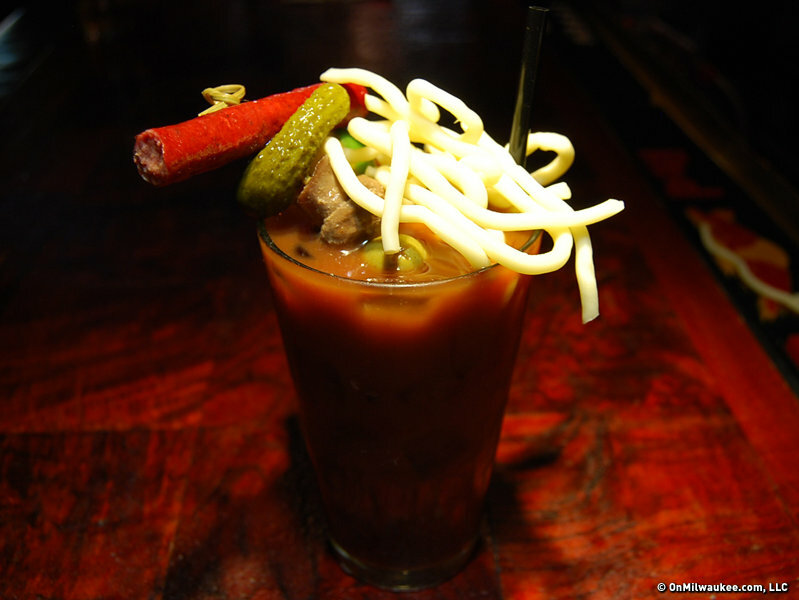 HERE’S a link to a picture of a Bloody Mary from this place here called the Wicked Hop, which has some of the best Bloody Marys in Milwaukee. Hmmm, ok that does look pretty tasty when you also include all the pickled stuff which would really complement the spiciness of the meat stick and the cocktail. I love that your blog introduces the rest of the world to Northern Midwestern Cuisine. Aside: I was in Milwaukee once and ate at Oakland Gyros. It was tasty but put me in the bathroom for 12 hours. Oh man, I haven’t been to Oakland Gyros in forever! In college I’d usually end up there for late night food after a long night of drinking. They would always have lines way out the door. Thanks Nick….this is Chef Tom from Motor. I created the Apple Bacon Burger and am glad you had a chance to try it. More burger specials coming every month! !